The US Military routinely trains in tandem with other friendly Nations. Furthermore, these Nations regularly train on each others training ranges. One of the key challenges to allowing this is to ensure that each country follows the host countries safety process. A common tool and implementing an accepted process that could accommodate all aircraft and weapons was needed. WDZ was originally conceived as a multi-service (Army, Air Force, Navy, and Marines) joint project to create Safety Zones for weapons on fixed and rotary-winged platforms. WDZ is one of several tools in the Range Managers Toolkit (RMTK), a suite of ArcGIS Desktop extensions supporting both Range Safety and planning operations. As of 2014 WDZ has expanded to include Foreign Military Sales, bringing the same ArcGIS integration to Allied nations as a mechanism to help support their training exercises. 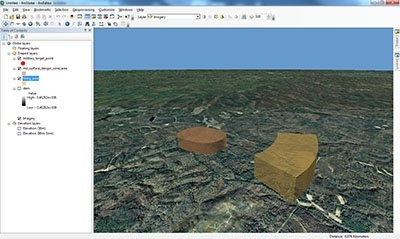 The WDZ Tool is a long-standing ArcGIS extension that creates Weapons Danger Zones for air to ground training exercises. GISi continues to maintain the WDZ while providing new enhancements to meet client requirements. The successes of this project has helped pave the way for FMS projects. As the leading experts in danger zone generation, GISi has provided multiple nations with the WDZ Tool. The version provided to each nation come with a customized database with only the weapons used by their military services. The danger zone creation engine is customized to work only with this country's database. GISi provided new user training across the globe for each country. WDZ Footprints can be exchanged between countries to provide Safety analysis while training on each others lands. As the WDZ tool rolls out to different countries it is standardizing the air to ground safety process around the world. This will have long term efficiency outcomes in support of Joint Training events and utilization of each others training lands while adhering to the host countries safety requirements.